Image above – completed testing of CutUp Machine-It, for KitCAD. Less then two days to write/recycle existing rX codes, and some 10 days of minor alterations to provide more ability and functional uses. Processing now consumes around 10 seconds for 230 lines. The processed data from this point can be further altered to suit manufacturing processes and provide an ability for custom changes (eg: door gaps, the door sizes may not include gaps). A solution in the form of filtering selection while processing to alter the filtered (eg: door) sizes inclusive of end-user supplied size (eg: sum of door gaps total could be expressed as a negative number and entered for the filtered size addition) is included to allow instant review and provide an ability for end-users to make changes on-the-go without having to edit Object Items, edit Volume values or edit processing templates. Minor revision, help file (2Apr), and SDK information [PDF] (24Apr); The ‘DrillDown Machine-It‘ interface will reuse or be the same as the CutUp Machine-It code base and parts of the interface and is not included, read comments upon this post for more information in regards to Drill down and Processed Result/s Optimisation. 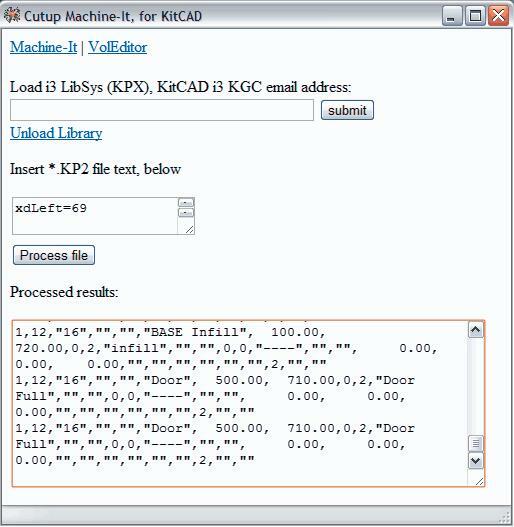 CutUp Machine-It, for KitCAD deployment to off-line KitCAD i3 KGC rX version installs and others occurred between April and May 2016. The May 1st is the Public release date however versions for all or some of the various target systems were released beforehand. See post Comments (Below) for End-user help, developer notes, testing, and update information. Over the next few months some older pages on the Kitchen Pages main website will be deleted or removed to other locations. Some new pages will be provided to include content that may be required. Links on other sites will be updated to include new content. The KitCAD 2010 Re-release InstallAware MSI installer downloads have been retired from use. The MSI installer downloads, or previous InstallShield setups and code-key request can still be accessed from historic pages from the KitCAD downloads webpage. 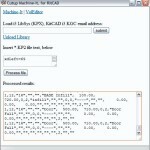 KitCAD i3 KGC file://localhost (TEST) win32 has replaced the previous 2.27 v5 main version offered to new users, from the KitCAD download website. At a later time the KitCAD 2.27 v5 functions found in KitCAD i3 KGC will be updated where, and when required. The UAC support currently found with KitCAD i3 KGC will be updated overtime to require Highest User Permission rights in-place of Administrator right (current version seeks Administrator rights, resulting in a permission prompt dialog window being displayed on application execution). You are currently browsing the archives for the KitCAD 2 category. ©Copyright 1999-2018, all rights reserved. Updated on the 19th of Feburary, 2018.